Lush Fab Glam Inspired Lifestyle For The Modern Woman: R.I.P Paul Walker The World Is A Better Place Because Of You. R.I.P Paul Walker The World Is A Better Place Because Of You. 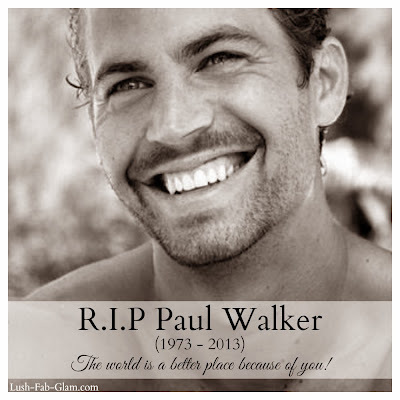 We were shocked by the tragic news of the death of actor Paul Walker on Saturday afternoon, November 30th, 2013. The 40 year old actor and father of daughter Meadow, 15 is best known for his role as undercover agent Brian O'Conner in the 'Fast & Furious' movie. 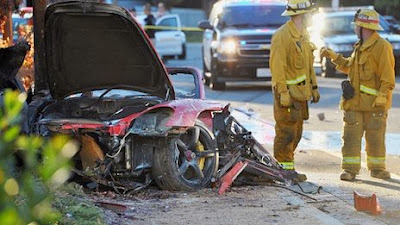 He was attending an event for his charity organization ROWW when the red Porsche that he was travelling in with his friend Roger Rodas crashed into a tree, then a light pole and according to reports burst into flames in Valencia, north of Los Angeles. As fans of both Paul Walker and the Fast & Furious movies we were deeply saddened to hear of his passing and in our bid to commemorate Paul's legacy we set out to discover more about him, his beautiful soul and the genuinely caring and kind man that he was off-screen. While he will always be remembered as a great actor who captivated our generation with his calm and cool persona, suave looks, piercing blue eyes and amazing stunt driving abilities on screen. It is the legacy that he created off screen and his dedication to making the world a better place through his charity organization ROWW (Reach Our Worldwide) that has left footprints on our hearts. (See the video below). May his family, friends and fans be comforted by the memory of his selfless contributions and may he inspire us to follow in his footsteps, going beyond our own concerns and personal aspirations to bring help and healing to those in need around the world. Read on to see an amazing and touching video of the late actor Paul Walker as he volunteers abroad and talks about ROWW., it will makes his fans fall in love with him all over again! 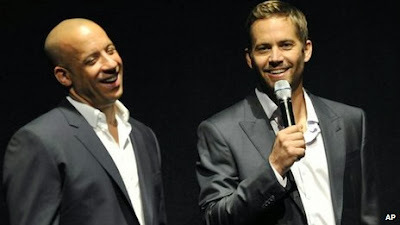 Plus read what his fellow 'Fast & Furious' actors Vin Diesel and rapper Ludacris shared about the actor's untimely death. 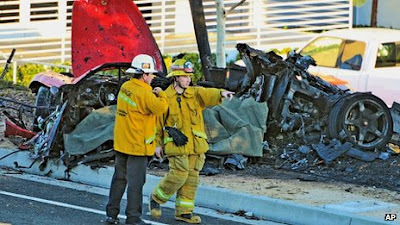 The graphic photos of fire fighters at the scene of the crash has circulated all over the web and the phrases '#RIP Paul Walker' and 'Fast & Furious' trended all night on twitter as fans, fellow actors and celebrities from the entertainment industry paid their respects to the late actor and sent condolences to his family. Photos from the crash site. There is much speculation amongst fans about the future of the Fast & Furious movie franchise, since Paul's death comes at a time when they were filming the seventh installment. This was far from the minds of his fellow actors however who had this to say about him. Vin Diesel wrote in a post on Instagram: "Brother I will miss you very much. I am absolutely speechless. Heaven has gained a new Angel. Rest in Peace." Rapper Ludacris also posted on Instagran: "Your humble spirit was felt from the start, wherever you blessed your presence you always left a mark, we were like brothers." Universal Pictures Statement: "Paul was truly one of the most beloved and respected members of our studio family for 14 years, and this loss is devastating to us, to everyone involved with the Fast & Furious films, and to countless fans. "We send our deepest and most sincere condolences to Paul's family." "ROWW is a network of professionals with first responder skill-set who augment local expertise when natural disasters strikes in order to augment relief efforts." Visit Roww.org to learn more about the initiatives they are currently involved in and how you can volunteer or make a donation. Must See Video Of Paul Walker volunteering with ROWW! You can see Paul Walker in his latest TV drama 'The Hours' which is airing soon. R.I.P Paul Walker the world is a better place because of you!